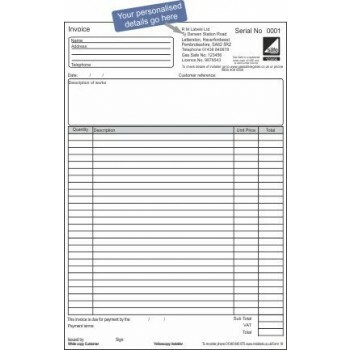 Personalised duplicate Invoice Pad CP19. 50 sets (A4 2 Part) with serial numbers on NCR paper. Comes complete with your company details pre-printed. This product is available with or without the Gas Safe Register logo and your Gas Safe Registration Number. The Licence number is left blank for you to complete as this changes every year. Please note when supplied with the logo this is a licensed Gas Safe Register product and can only be sold to Gas Safe Registered Installers. Before supplying the product with the Gas Safe Register logo we are required to check your company details with the Gas Safe Register and your personalised details must match the details held by the Gas Safe Register. Complete the boxes above with your personalised details, including your Gas Safe Registration Number if required.